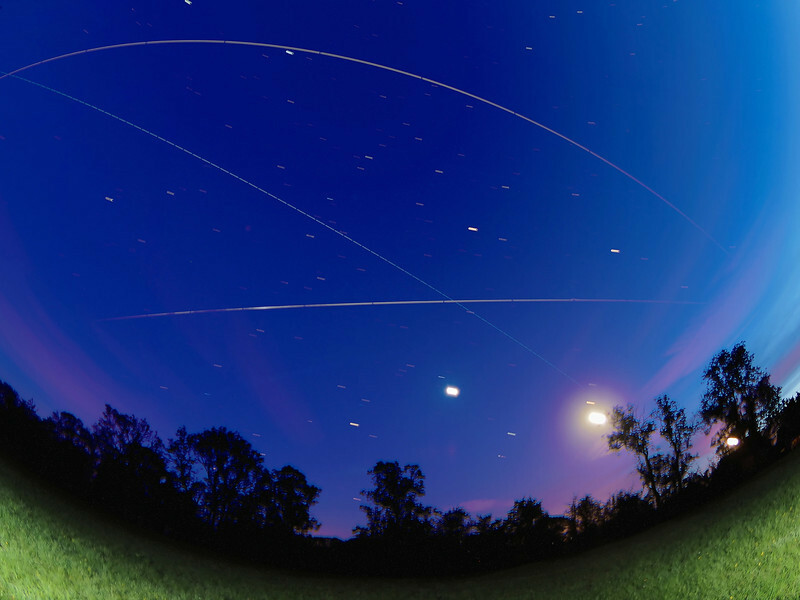 ISS triple flyby, 07/08 June 2014. The ISS delivers multiple flybys over UK skies during June allowing good opportunities to capture some or all, depending on cloud cover. This shot captures 3 passes, 2215hrs, 2350hrs & 0127hrs. How did I capture this? Firstly, using my trusty GoSatWatch app I was able to predict the times and directions for all of the ISS passes (Well worthwhile download from the app store). All passes were pretty much west to east so I set my camera on a tripod pointing due south. Using a wide angle lens (8mm fisheye) I set camera in manual mode on a wide aperture (F4) and long exposure time. For the first pass at 2215hrs the sky was not dark (ambient summer light) so I set at 1s exposure. For the later passes it was dark so I set at 15s exposure time. I set up the camera in readiness for the first pass and shot continuous 1s exposures for the duration of the flyby. I then left the camera on tripod and waited for the next pass at 2350hrs. Changing the exposure time I then shot continuous 15s for the duration. Same again for the final pass at 0127hrs. Once all complete I hauled all the gear back indoors and downloaded. Using StarStax (Mac) software I imported each flyby exposure to generate a composite image. I then imported the final 3 composites into same software which again produced a composite of all 3 passes. :-) The 3 bright subjects are the moon and to achieve a lit foreground I fired off the flash a few times during exposure. Difficulties with dew forming on the camera lens leaving outside for many hours resulted in a not so sharp image.